Not for the first time we awoke to find that we'd spoken too soon. 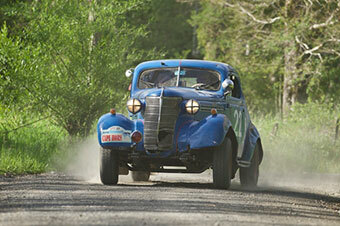 Despite battling into the early hours Ross Lilleker and David Cooley couldn't fix their Ford Model A. They had all the necessary bits and pieces and plenty of expertise on tap but thanks to the problems they had already experienced the axle casing had deformed which meant that the new components wouldn't fit. We last saw them on a truck at the border waiting to cross. A sad sight but they're a determined pair and are convinced that they can play catch up. For those with four wheels still on their wagon though the day started well. A few km of the finest Chilean tarmac led us to a lengthy gravel section through a typically green and pleasant land. Passing sheep in fields and wooden farms houses we breathed in the gentle aroma of woodsmoke. Unfortunately gravel brings it's own problems - or challenges as we prefer to call them. And today it was a case of another day another dust bowl as we watched a procession of cars make their way through the first passage controls. There was a further 16km of steep uphill gravel to the Chilean border. Twisting and turning certainly but wide and well surfaced and once again thick with dust. By the time we reached the border it's safe to say that no one looked like their passport photo any more. Days of burning sun, drying winds and now a good coating of dust will give the beauticians at the Llao Llao spa plenty to think about. When we got to it, the border was a cold and windy place it's 1200m high so we didn't really want to hang around for too long and thankfully we didn't have to. Both Chile out and Argentina in were handled reasonably well, it's a small border though and the strain of almost 100 rally personnel to clear immigration along with their 40 cars to export and import led to some pretty long queues for the locals who were also trying to cross. Once you've cleared immigration then the driver of the car goes to customs to sort out the car carnet. Our friends at the RAC sorted this vital document in advance for all of the rally cars without it we'd be looking at a much longer process at each border. 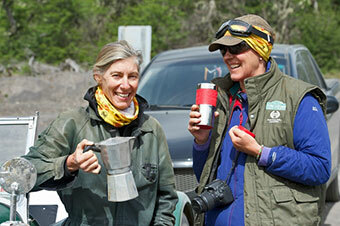 Navigators can use this time without the driver to good effect, Barbara Philips for example busied herself with the espresso maker, Marie Odile Besson sat as low as she could out of the wind and Luc Janssens helped Christian Dumolin charge his battery. Once back into Argentina we descended through a landscape full, of dead dry trees, misty peaks, looming clouds and we felt the odd spot of rain as we drove down the road. This is an altogether more windy,wetter and wilder Argentina than that which we left behind the last week. In a word the weather looked ominous and as the kilometres rolled by it had well and truly closed in. Once out of San Martin de Los Andes where many crews took the opportunity to have some lunch in one of many excellent cafés it was up and up and up on a set of flowing gravel bends. Thankfully it was still raining and this time the dust was kept well under control unlike like the rear wheels of some of the cars. Out of this section we rejoined the main road running alongside the first of many lakes such as the Lago Hermosa which was all but hidden in the mist. The many roadside miradors mocked us as we turned from one cloud covered mountain to another and we could only imagine what fantastic landscapes were hidden from us. Pity the poor photographers amongst us, pent up in their cars, trapped like goldfish in a bowl ...of milk. Pity also the open car crews. Today was more like a yacht race at times than a car rally as Mother Nature assailed them with yet another one of her elements. Ladies and gentlemen of the open car cadre, we who have a roof salute you. There was no let up through the Parque Nacional Nahuel Huapi. Low clouds, torrential rain and some of the most rutted gravel this side of Mongolia had to be tackled along with deep splashing muddy puddles. Thankfully this surface eventually gave way to silky smooth tarmac and the sort of 360° wide open views which leave you with a sore neck. 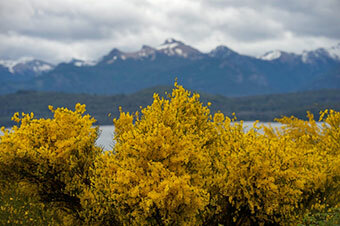 The roads around here are lined with all manner of trees and plants but the most striking is the bright yellow flowered shrub which we believe is called Calafate, the Magellan barberry. It certainly cheered up a pretty grey day. By the time we got to Bariloche the rain had stopped but there was a full gale blowing with there were waves crashing against the beach at the lake and the boats in the marina pitching and tossing against their anchor chains. Tonight we are at the Llao Llao. One of the best hotels in the world apparently and tomorrow is a rest day. Happy days indeed. Finally, in response to overwhelming demand, and obvious necessity, we bring you Fred's Facts, an occasional series on motoring matters and all things rally related. 1 - Fuel facts. Petrol cars work best with petrol. Herr Diesel and Mr Bentley never met as far as we know and, Mr Bailey, they never should.